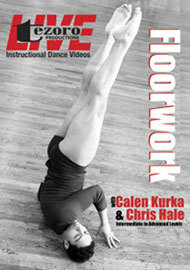 Learn the basics of Floorwork Technique with Calen and Chris! In this innovative DVD, they will teach you step-by-step basic techniques to create seamless transitions on and off the floor. After going over the basics, this video concludes with four contemporary routines ranging from jazz, lyrical and modern. This video is designed for the Intermediate to Advanced dancer.